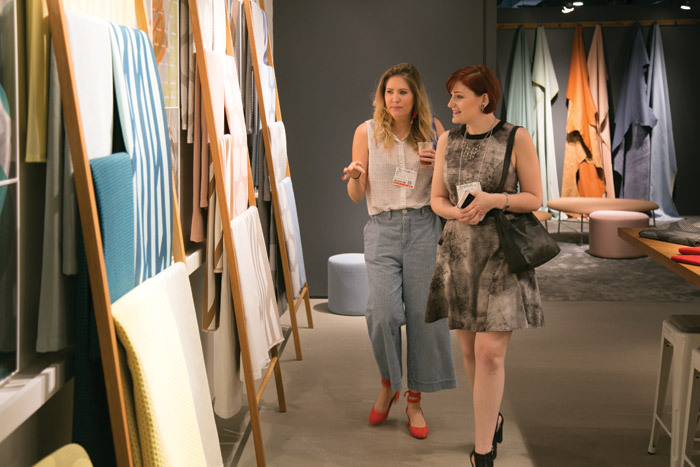 With nearly 93,000 sq m (a million sq ft) of exhibition space, NeoCon 2018 featured new, improved, classic and prototype products and services from both leading companies and emerging talent. 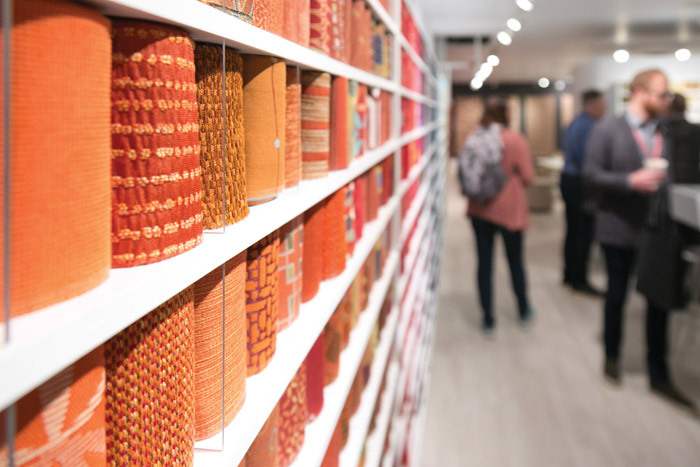 The show welcomed more than 50,000 visitors and was held in downtown Chicago at the Merchandise Mart, a leading retailing and wholesale destination. 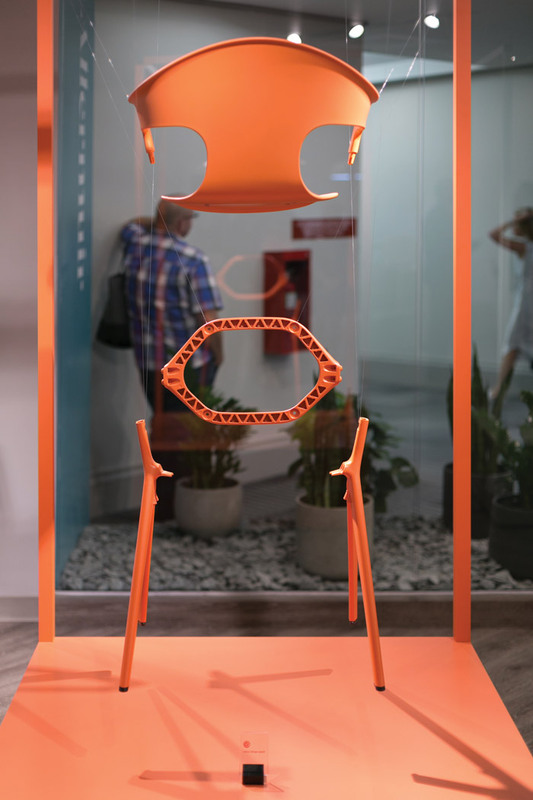 Swarms of visitors gathered daily in the Knoll showroom to explore Hospitality at Work. The showroom space featured five individually themed spaces, illustrating the power of hospitality in today’s workplace: welcoming environments, user-directed experiences, flexible solutions, material variety and residential aesthetic. Sustainability and the environment were evident in Knoll’s permanent space with the unveiling of its Full Circle environmental programme, which sees the global firm join forces with international partners to reduce landfill. American textile specialist CF Stinson is taking wellness to a whole new level with what proved to be one of the most innovative product unveilings. The firm debuted its Celliant product, the contract interiors industry’s first-ever responsive woven-textile collection, designed to increase energy and reduce fatigue while sitting, using a fabric that features proprietary infrared fibre technology, ultimately aimed at promoting energy and wellbeing. Celliant is based on three scientific principles: that bodies emit heat, that certain naturally occurring minerals absorb heat and give off far infrared energy, and that this energy is recycled back into the body increasing tissue oxygen levels. Allermuir transformed its showroom in the Mart into a creative laboratory that hosted a dramatic installation by London-based designer Benjamin Hubert. A new and sophisticated look for the brand was revealed, yet with a focus on standalone spaces that were dedicated to being instagrammable. Framery, the Finnish privacy pod creator, launched its latest innovation in soundproof working spaces with 2Q, a booth designed for up to six people. A new and improved sound insulation system ensured that nothing at all could be heard from inside the space when the door was closed, and nothing could be heard from outside. As well as launching a new flooring-product range named Inside Shapes, in collaboration with Stockholm based design studio Form Us With Love, Shaw Contract Group is on a sustainability mission. As we all know, plastic waste is a global issue, and Shaw Contract’s new PET Resilient product category is an example of design’s ability to make a meaningful impact. Made from 40 per cent post-consumer PET – with 16 bottles being recycled per square foot of product, 64 recycled bottles per plank, and no plasticisers, chlorine, or PVC – Shaw Contract has produced a product with unprecedented performance attributes to make a positive impact on the built environment. The exhibition was complemented by a world-class seminar programme featuring some of the most creative talents in the industry. Presentations included panel discussions, talks and keynote addresses that reflected on innovations in the contract industry and discussed the infinite possibilities for the future of commercial design. Two of the core-strand presentations focused on, or were given by, women in the industry. The first was a panel discussion moderated by Interior Design magazine’s editor and chief, Cindy Allen. The discussion, entitled She said, she said, took place in front of a big audience that heard from powerhouses managing principal at Gensler Robin Klehr Avia, Hariri & Hariri Architecture principal Gisue Hariri, and Rottet Studio principal Lauren Rottet. The panel, with personal anecdotes and insights, shone a light on the struggle of entering the boys’ club of architecture and design. The second was a presentation by Carol Ross Barney, founder and design principle at Ross Barney Architects. Honoured with more than 100 design awards, Ross Barney has been in the vanguard of civic space design since founding her practice in 1981. The main thread of the talk was about Chicago’s River Walk, which Ross Barney has transformed over the past few years with the aim to enrich the metropolitan experience for Chicagoans and visitors alike. If the enthusiasm of exhibitors and visitors alike is anything to go by, NeoCon is well set for the next 50 years. To quote actor Michael Douglas, ‘Hollywood is hype, New York is talk, Chicago is work’. As NeoCon enters the second half of its first century, it appears the world of work is moving at such a rapid rate that it’s almost hard to keep up. Rest assured, however, those at the heart of designing and creating these spaces to work in, eat in, stay in and learn in are persevering behind the scenes, ready to unveil the next Mart-full of developments.